Are you planning a theme party and need help? If you are as busy as I am, the planning process, and even the day of the event, can be very stressful. There are so many details to pull together that you may find yourself completely overwhelmed as I once did. 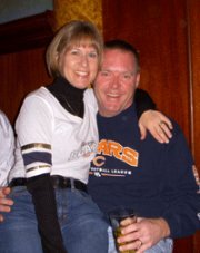 I have a passion for hosting parties from elaborate themed affairs to our annual Chicago Bears party every December, I love it all. I am a very busy wife and mother who worked in Corporate America for over 20 years and now manages an e-business from home which includes this theme party website. To be able to juggle this busy life AND host memorable theme parties, I developed several shortcuts to keep myself organized which have made my life as a busy party host so much easier! Sprinkled throughout this site, you will find creative party theme ideas that I use every time I entertain. Tips and techniques learned from years of hosting my own parties and from family and friends. And every time I host a party, I learn more time-saving tricks! You will find loads of easy recipes here too including some of the most requested recipes by family and friends and several others submitted by visitors. There are so many different theme parties to choose from, many of which coordinate with the time of year. For example, it's common to host an Ugly Sweater theme party in January. Why? Because January is the coldest month in most of the United States and sweaters are the perfect attire. February brings opportunities to host Valentines, Mardi Gras and basketball parties. In addition to hosting parties based on time of year, general theme parties are also fun, like hosting an event around a color (ex. a Red theme party where attire, food and decorations follow the color), or a wine party. Here are some of our favorite theme parties. 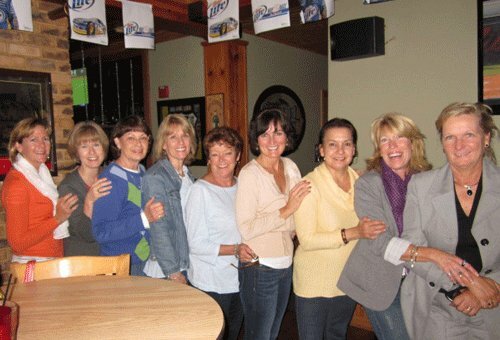 Women Parties - Whether you spend the night at home or out on the town, plan a girls only night with your best friends. Here you will find several ideas, including a train crawl and a sangria soiree. This photo shows me (second from left) with some of my best friends at one such outing. Kentucky Derby Theme - It's fun to stay home and watch the Kentucky Derby on TV, but it's even more fun if you do it with friends. Pick up some tips and traditional Derby recipes including Mint Juleps, Benedictine and Kentucky Derby Pie. Cinco de Mayo Theme - If you and your friends love Margaritas and Mexican food as much as we do, host a Cinco de Mayo party and serve your favorite Mexican fare. Get some easy party ideas and simple recipes here. Yard Parties - In locales where warm weather months are limited, like Illinois where we live, hosting at least one yard party per year is a given. As soon as the weather starts warming up, I am already thinking about what kind of yard party to host. I put together a page with some of our favorite things to do and eat at a yard party. Luau Theme - Luau parties are popular mainly because the decorations are easy to find, the food and drinks are fun (especially the foo-fee drinks!) and the attire is simple. Just thrown on a flowery shirt, add a couple of leis around your neck and you are ready. Ladies Night Martini Party - Host a ladies night martini party at home for a few of your favorite girlfriends. 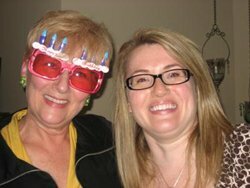 Learn how my daughter and I did it and get the recipes we served. 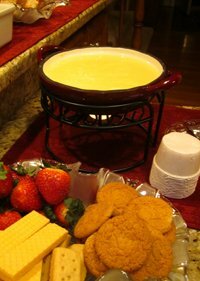 Hosting Fondues - Want to learn how to host an easy fondue party at your home? Find useful tips on attire, choosing fondue pots and fountains and selecting the perfect fondue recipes and dipping sauces. Bunco Parties - Find everything you need here to host a Bunco theme party, including how to play Bunco, setting up your home, free Bunco score cards and Bunco theme food. Wine Tasting Parties - Wine tasting party ideas, including types of wine tasting parties, free wine tasting cards, how to set up your home, how much wine to buy and wine-cheese pairing ideas. When I began planning parties years ago, the first hurdle I ran in to was getting the invitations out. I wanted to be able to invite alot of people, but I certainly did not have time to fill out invitations, address envelopes and mail them the old fashioned way. I was BUSY like most people so how could I resolve this issue? I decided early on that it is more important to get the invitations out than to worry about how fancy they are, so I learned how to create invitations in PowerPoint, how to create labels in Microsoft Word and get them in the mail quickly and inexpensively. This was before email. To this day, I still use Microsoft for most invitations, but now I email them. Watch my how to create invitations in PowerPoint video, and if you want to mail them, watch my how to create labels in Microsoft Word video and learn how I do both. Tip: You can either ask for a response from every single invitee by simply saying "RSVP" on the invitation, or like I've done in recent years, you can ask for "Regrets Only" and assume that all invitees are coming to your theme party unless you hear otherwise. Managing regrets only is a lot easier. If you are hosting a classic theme party, like a Luau or Kentucky Derby theme party, then obviously you want your food choices to represent the theme. For example, if it's a Luau theme, you might serve Rum Punch and for Kentucky Derby, appetizers like Benedictine work well. Choosing recipes to match the theme is the easy part. The harder part is figuring out how much food and drink to have available. Classic theme parties are different than intimate dinner parties, brunches or similar events when it comes to food choices and quantities. Generally people do not eat much unless it is a sit down dinner. Even when I host theme parties for teenagers they do not eat or drink half as much as I thought they would so I've learned not to overdo it. At most of my theme parties, I now serve only appetizers, desserts and drinks. Appetizers - At every great theme gathering, appetizers and dips are served, right? They range from the sweet and fluffy kind served with fruit, to the warm and gooey kind served with crackers and chips. The rule of thumb that I use is for every 4 people, have 1 appetizer available (12 people; 3 appetizers). Choose from this list of appetizers and dip recipes most requested by my friends and family. Desserts - I have found that people eat even less dessert than they do appetizers so I generally have 1 dessert for every 6 people (12 people; 2 desserts). This list of best dessert recipes, including this Lemon Cream Fondue, are all easy to make, taste great, have few ingredients and are easily adjustable for any number of guests. Drinks - I like to have a wide variety of fun party drinks available. Non-alchoholic, alcoholic, warm and cold. For non-alcoholic, I always have water and soft drinks available. For alcoholic, always wine and beer. I don't worry too much about the quantities of this stuff because if I buy too much, it will eventually be used. Choosing the menu, finding the recipes, shopping for the ingredients and preparing the food usually monopolizes most of my planning time. I love doing it all, but I also love figuring out how I am going to set up our house for the big day. I never have been big on spending a huge amount of time decorating the house, I guess because I have always been so busy and would rather spend the time on food and drinks. At a minimum, I always have several candles burning and usually several centerpieces scattered around the house, including in the bathrooms like this one. 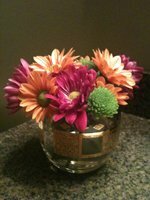 Look for some very simple centerpiece ideas here. Depending on the type of party, I may also rearrange furniture, add tables, set up additional seating, maybe throw some confetti on the serving tables and sometimes put up banners and streamers. I share many of the things I do for decorating the house here. Some of the most memorable parties I have either hosted or attended involved some type of game or activity. A favorite among my silly friends is a game called "Big Booty" which is hysterical to watch. Another one of my favorite games to play is Bunco because you can eat, gab your head off and still play without losing your place. A perfect game to play with your girlfriends. 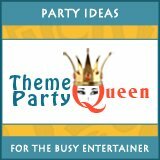 Last year we ran a contest and our Theme Party Queen visitors submitted some of their favorite group games and boy did we get a great assortment of ideas. One of them was the Hot Potato Bags game which people of all ages can play. It's perfect for large groups. Printable games, like word searches, match games and trivia, are also alot of fun especially for less active guests. On certain theme pages, you will find printable game packages that can be downloaded immediately. Scavenger hunts are also a favorite among party-goers, including children. We have several pages filled with scavenger hunt ideas and an ebook you can download that has 10 free scavenger hunt lists to get you started. Remember: It is not about how elaborate and over-the-top your theme parties are. It's about providing a fun place for your friends and family to gather and spend time together. Keep it simple, stay organized and even busy people can entertain at home with ease and confidence.